Need a prominent display for a storefront that informs customers with important information? 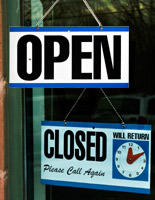 These business hour signs will tell a passerby when an establishment is open or closed. This includes simple flipping placards as well as changeable illuminated signboards. Also available are large window letters that can be used to create custom messaging. These can attach to glass to inform patrons of sales events, pricing information and new available goods. For business hour signs, or open closed signage, suction cups are offered to hold them up. These feature an adhesive backer and can support other store accessories. How can these different retail fixtures be used? Window letter sets are ideal for creating custom messaging. Available in Day-Glo orange and yellow, they can measure 5" or 8"in height. This makes them easy to see in any store display, and they will pop out to passersby. Each 5" kit includes 190 characters while each 8" set includes 132 characters. To attach them, clean the glass with a cleaner that does not leave a film. Symbol kits include a squeegee applicator that helps them stick to surfaces. They do not require glue or tape to stay on. These characters can be placed in a straight line alternatively in an arch to create interesting signage. 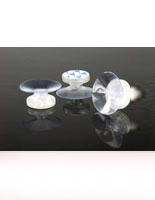 These suction cups, while simple, have a wide variety of uses for assisting storeowners. They can stick to metal, plastic, glass, Formica, linoleum and fiberglass. Each suction cup is made of high quality PVC and has many applications in commercial and even residential environments. With their Velcro® adhesive backing, they can hang signage fixtures, curtain rods, mirrors, bird feeders and thermometers. These vacuum mounts must also be placed on a clean surface to ensure that they will stick. Each one can hold up to 5 lbs. of weight and is made of UV-stabilized material to resist yellowing and deterioration in the sun. Hour signs come in two main designs. The affordable placard includes a suction cup for support and has an "OPEN" side and a "CLOSED" side. This half also includes the message "WILL RETURN" and a small hand clock that shows when the store will open again. Open closed displays are also available with LED illumination and a chart that lists operation times each day of the week. These use reusable vinyl stickers that give them a professional look. In addition, each hanger includes a long power cord, a rocker on/off switch and a hanging kit. This type of fixture is offered in a portrait or landscape orientation and the former has an extra feature: showcasing large LED text that reads "OPEN" in red or "CLOSED" in orange. These signs and letters are excellent for attracting attention to any brick-and-mortar store. Customers will know when they can browse wares, and with the character sets, they will know what is available and on sale. Prominent advertisers like these are easy to notice from a distance, making them great for any storefront. For wholesale pricing on 1000s of retail solutions, shop on SignSupplies2go.com!